Benjamin Graham taught that Intelligent Investors must do a thorough fundamental analysis of investment opportunities to determine their intrinsic value and inherent risk. This is best done by utilizing a systematic approach to analysis that will provide investors with a sense of how a specific company compares to another company or by reviewing the 10 Stocks for Using A Benjamin Graham Value Investing Strategy – February 2017. 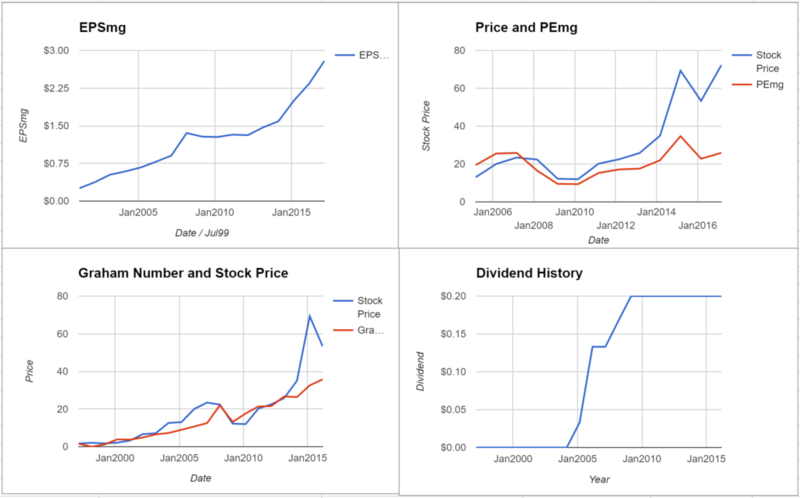 By using the ModernGraham method one can review a company’s historical accomplishments and determine an intrinsic value that can be compared across industries. 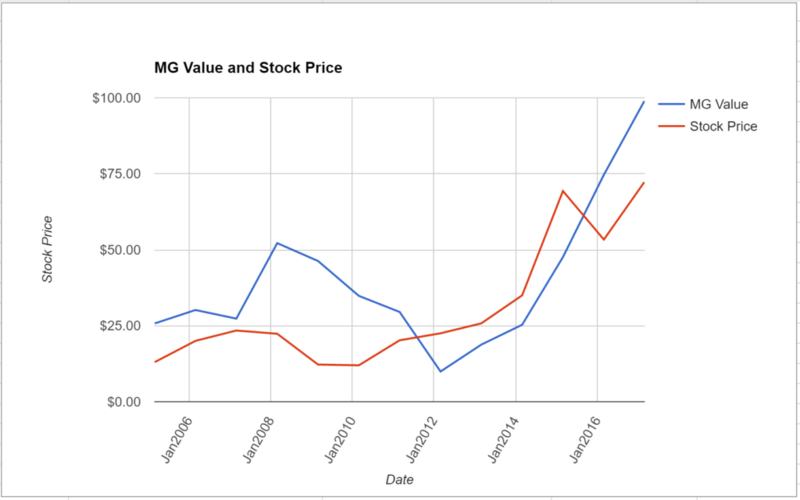 What follows is a stock analysis showing a specific look at how Multi-Color Corporation (LABL) fares in the ModernGraham valuation model. Company Profile (obtained from Google Finance): Multi-Color Corporation (Multi-Color) is engaged in label solutions business, supporting brands, including producers of home and personal care, wine and spirit, food and beverage, healthcare and specialty consumer products. The Company serves international brand owners in North, Central and South America, Europe, Australia, New Zealand, South Africa and China and Southeast Asia with a range of label technologies in Pressure Sensitive, Glue-Applied (Cut and Stack), In-Mold, Shrink Sleeve and Heat Transfer. The Company also provides a range of print methods, including flexographic, lithographic, rotogravure, letterpress and digital, and in-house prepress services. The Company provides graphics and pre-press services for its customers at all of its manufacturing locations. These services include the conversion of customer digital files and artwork into proofs, production of print layouts and printing plates, and product mock ups and samples for market research. Multi-Color Corporation is suitable for the Enterprising Investor but not the more conservative Defensive Investor. The Defensive Investor is concerned with the small size, high PEmg and PB ratios. The Enterprising Investor is only concerned with the level of debt relative to the net current assets. As a result, all Enterprising Investors following the ModernGraham approach should feel comfortable proceeding with the analysis. 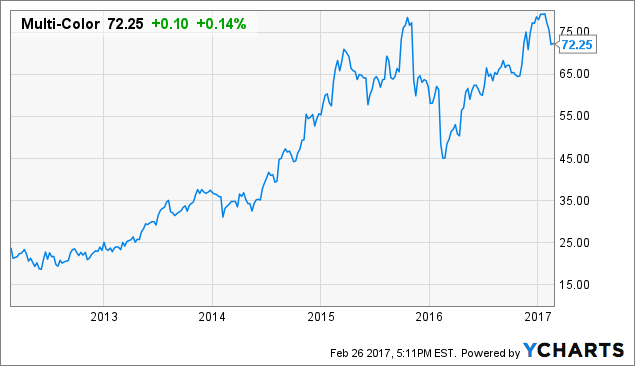 As for a valuation, the company appears to be Undervalued after growing its EPSmg (normalized earnings) from $1.47 in 2013 to an estimated $2.79 for 2017. This level of demonstrated earnings growth outpaces the market’s implied estimate of 8.71% annual earnings growth over the next 7-10 years. As a result, the ModernGraham valuation model, based on the Benjamin Graham value investing formula, returns an estimate of intrinsic value above the price. At the time of valuation, further research into Multi-Color Corporation revealed the company was trading above its Graham Number of $39.96. The company pays a dividend of $0.2 per share, for a yield of 0.3% Its PEmg (price over earnings per share – ModernGraham) was 25.91, which was above the industry average of 21.9. Finally, the company was trading above its Net Current Asset Value (NCAV) of $-26.47. Multi-Color Corporation receives an average overall rating in the ModernGraham grading system, scoring a C+.